The rock and others near Curiosity's drill site appear to have moved when the drill was retracted. Seven years after landing on Mars' Gale Crater, NASA's Curiosity rover has crossed a big milestone in its mission to explore the Red Planet — biting into the clay-rich planes of Mount Sharp, a region that scientists suspect was shaped by flowing water. After Curiosity drilled through the bedrock on 6 April, it fed a chunk of the sample to its internal mineralogy lab. Mission engineers at NASA's Jet Propulsion Lab said that the rover "chewed easily" through the soft rock (which was named "Aberlady"), to collect the first sample of the mission that required just a rotating drill to obtain. 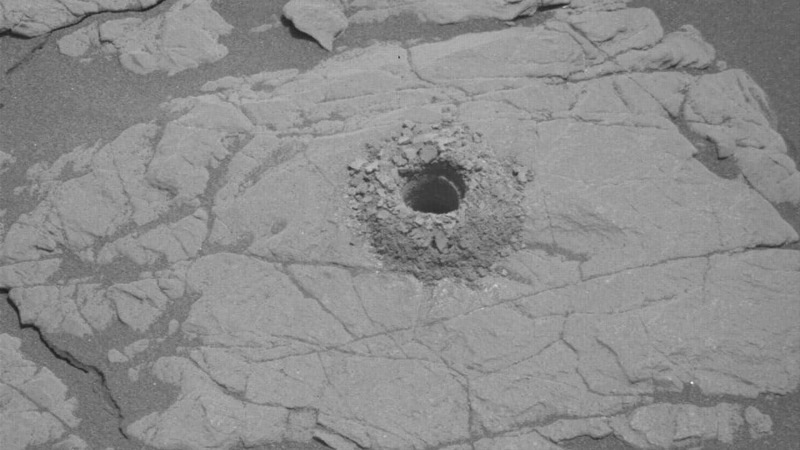 Unlike tougher targets that Curiosity was up against in the past on the Vera Rubin Ridge, the rock it drilled last week was "so soft, in fact, that the drill didn't need to use its percussive technique, which is helpful for snagging samples from harder rock," the statement said. The five-kilometer tall mountain Curiosity is perched on now is the target of an important scientific study in the mission. The rover began its trek up the mountain in 2013, making it to the mission's target site in September 2014. This was after NASA's Mars Reconnaissance Orbiter (MRO) sniffed out a strong "signal" of clay before Curiosity's 2012 landing. Now that Curiosity has arrived to investigate it, the mission's science team hopes to understand from the samples if there was a time in Mars' past when flowing water shaped this layer of Mount Sharp. "Each layer of this mountain is a puzzle piece," Ashwin Vasavada, a Curiosity Project Scientist at JPL said in a statement. With every sampling mission, scientists are expecting to sneak a preview of a different era in Martian history from its mineral composition. We're excited to see what this first sample tells us about the ancient environment, especially about water." NASA plans to have Curiosity drill many more times over the course of 2019 and 2020, to understand how this region, with all its diverse rocks, sand (and pebble!) is different from the rover's previous campsite at the Vera Rubin Ridge. Meanwhile, elsewhere on Mars is another NASA mission hammering into rock — the InSight lander. The lander's Heat and Physical Properties (HP3) instrument finished a new round of diagnostic hammering into Mars' surface on 26 March 2019 as another instrument — the quake-detecting seismometer — listened for how sound waves passed through the rock beneath. This test wasn't part of InSight's exploratory missions, but instead some necessary troubleshooting. 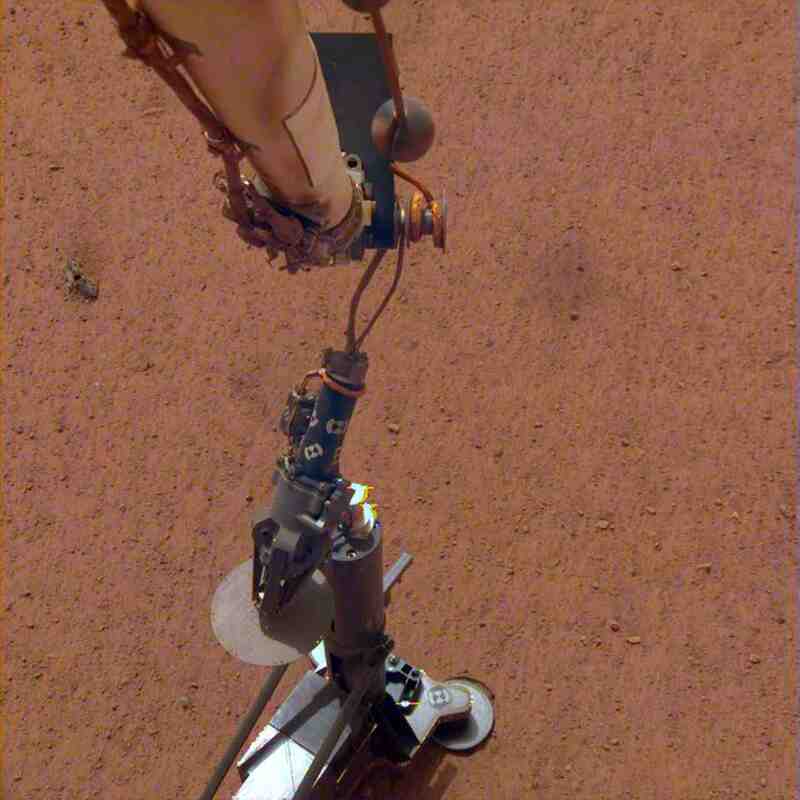 InSight hit a brick wall in an attempt to drill a hole into a chosen patch of ground to stick its HP3 instrument into. The drill was blocked, and InSight's probe has been hammering the surface and listening in with its seismometer to understand what the obstruction is. The science team thinks it could be a single rock, a layer of gravel or a jammed cable from something getting into the lander's protective housing. The InSight team had hoped that the probe would be in the ground within a few months of InSight's landing. But even if it takes a little longer, the mission can go on unchanged if InSight manages to dig 3 meters underground. Over the remaining days of April, NASA plans to conduct 10-to-15-minute hammering tests as part of the troubleshooting. InSight's seismometer will "listen" to the hammer (called the "mole") striking whatever obstacle is in its path with the hope of shedding some clues as to what may be blocking it. The camera on InSight's robotic arm will also capture photographs of the mole's support structure in the hopes of catching any possible movement induced by the mole as it hammers away.